Over the years, we've managed the online reputations of many executives working in industries such as clothing, manufacturing, hospitality, biotechnology, and politics (foreign and domestic), to name a few. This case study focuses on an executive from the financial industry we worked with whose problems included articles in the New York Times, Bloomberg, and Ripoff Report. Names and circumstances have been adjusted to some degree to protect the identity of our client. Our client is a well-known member of the New York financial community planning to run for political office. Because of the client's notability, he was sought after by journalists and bloggers, and harassed by activist groups. He'd been tangentially involved in the operations of the financial services company in which he worked and was caught in the "blast radius" of bad company press. Investigative journalists focusing on New York politicians featured our client, painting him in a harsh light. To make matters worse, the attention by major news outlets was exacerbated by bloggers and others seeking to worsen his online reputation by posting opinion on negative review sites. Reputation X was hired to repair search results for this client. The first page of results contained a New York Times article, Ripoff Report, and a Bloomberg article, all of which were negative. Our task was to remove as much as possible, to provide a counter-narrative, to dilute with honest and relevant stories, and to push down (suppress) any remaining search results, so he could move on with his life. Our team began by examining problem pages like the New York Times, Ripoff Report and Bloomberg. We considered using a legal strategy, but ultimately decided against it, as legal options tend to be very expensive, and the chances of success were low because publications like these very rarely decide to take down an article. For the same reason, removing the posts at the source through relationships or negotiation would also likely be costly and ineffective. So we proceeded with a strategy that included the use of search engine optimization (SEO) to move the pages off the first and second pages search results. Having thoroughly researched our client and compared his search profile with those of similar people, we discovered gaps between the kinds of online profiles people and search engines find relevant and those of our client. This provided opportunities for content and technical development that would immediately begin the process of improving our client's online standing. At Reputation X, we follow the maxim: "Compare, then make better". In this part of the process, we were able to do so by comparing our client's search results with those of similar people and roughly emulating their success. We selected four other individuals in the financial services and political realm with similar levels of notability to study. Their search and social media results were examined, as were inbound linking structures, and other technical criteria that could help us in crafting a better narrative. We then developed a persona that included an example of "ideal" search results. Based on our research, we considered what a similar person should include in their online representation, then compared results with our client's current search profile. In our client's case, social media profiles were prevalent on the first page of search results, as were sites and articles showcasing charitable works, Wikipedia, and Google's Knowledge Panel. The Knowledge Panel below (not a client) has reverse-engineered data boxed in red. We found that our client would benefit from a Knowledge Panel depiction in search results. The Knowledge Panel is an organized cluster of content placed directly in the upper right corner of search results. It is sometimes called a Knowledge Graph, especially for businesses. The Knowledge Panel displays relevant knowledge drawn from various online sources, and it occupies about 40% of the space at the top of normal search results. We knew that focusing on the Knowledge Panel would provide dilutive content (good content to flush out the bad) to search results by necessitating a Wikipedia page. Using this method, we could kill two birds with one stone, and it became the backbone of the reputation campaign. In order to earn the display of a Knowledge Graph, a series of events needed to happen. 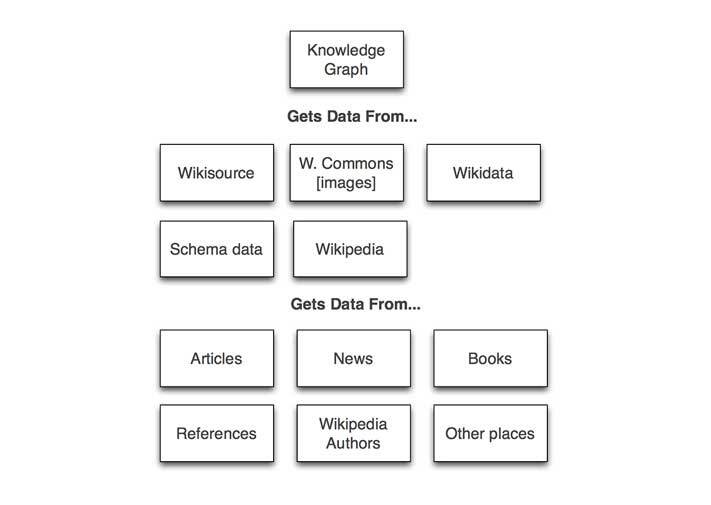 The Knowledge Graph gets much of its information from Wikipedia and curated meta data like WikiData, Virtual International Authority File, WikiNews, and others. We reverse-engineered the graphs of similar people and drew up a content, publication, and development plan based on the building blocks of the graph. A person of stature can usually earn a Wikipedia page if she or he is well-known, or has a degree of notability whose accomplishments can be verified with references. Wikipedia pages without good sources get deleted in short order. Our client was well known, but didn't have the level of documented notability we felt was needed to earn a Wikipedia entry. So we created some. Our relationships enabled us to locate a Forbes writer that was perfect for the job. But before he could be approached, our client needed something newsworthy to act as a launchpad for the eventual story. We worked with our client to create a story and an accompanying press release. We launched it, garnered social media praise, and used the press release as the kernel needed for a great story. The author wrote the article according to Forbes's own journalistic guidelines, and was published. We similarly arranged the development of a few more third-party articles, and soon had enough reference material to populate a Wikipedia page. To do this, we worked with a Wikipedia writer to develop a basic, honest, and relevant profile using existing and recently created third-party content as reference material for the Wikipedia page. Wiki pages are publicly editable and must always be created with that fact, and the highest journalistic standards, in mind. All content must be verifiable and true. We succeeded in creating a Wikipedia page, Wiki Commons images, content, and more. With the publication of the Forbes article and others, the Wikipedia page, and online images, search results began to change. Our next step was to strengthen our client's LinkedIn, Facebook, and Twitter pages. At this point, the Knowledge Graph had not yet made its debut. We revisited Wikipedia, linked the new and existing web properties, press, and social media, and then moved to create meta data. In short, meta data is data that describes other data. It summarizes information about a chunk of content (like a web page), and makes it easier for search engines to verify the right information to include in many places. Meta data is usually invisible to human visitors, meant only to guide Google bots in their voyage across the internet. At this point in this reputation campaign, we began to implement meta data into websites we created for our client so that the information contained therein could be indexed by search engines more effectively. We also worked with websites specifically designed to describe relationships between data. Seldom seen by people, these are key to the operations of search engines. We used those sites to draw road maps between the Wikipedia page and other content relevant to our client. Google followed the breadcrumbs we had laid out, and eventually... voila! The Knowledge Panel appeared! The problem pages -- Bloomberg, New York Times, and Ripoff Report -- had by this point all moved down on the first page of search results. They had been replaced by the Forbes article, Wikipedia, the corporate leadership page from the parent corporation, an image bar depicting images we had placed on various sites of our client, and more. But the negatives, while far less visible, still existed on the page. Ripoff Report was fluctuating between pages one and two. By working to create the Knowledge Panel, we had created an entire ecosystem of relevant content that was engineered to succeed. Social media profiles were still languishing on page two, so we redoubled our efforts to attract followers, refresh content, and increase overall relevance. Over a period of a few months, these pages gained ground. Facebook and Linkedin successfully appeared on the first page of search results and stuck. Ripoff Report had been banished to page three and continued to drop. The NYT article was relegated to the bottom of page one, and Bloomberg faded between page one and two. Client now controls 70% of first 20 results. 40% of the first page. Three extremely difficult sites to move were diluted, then pushed down. 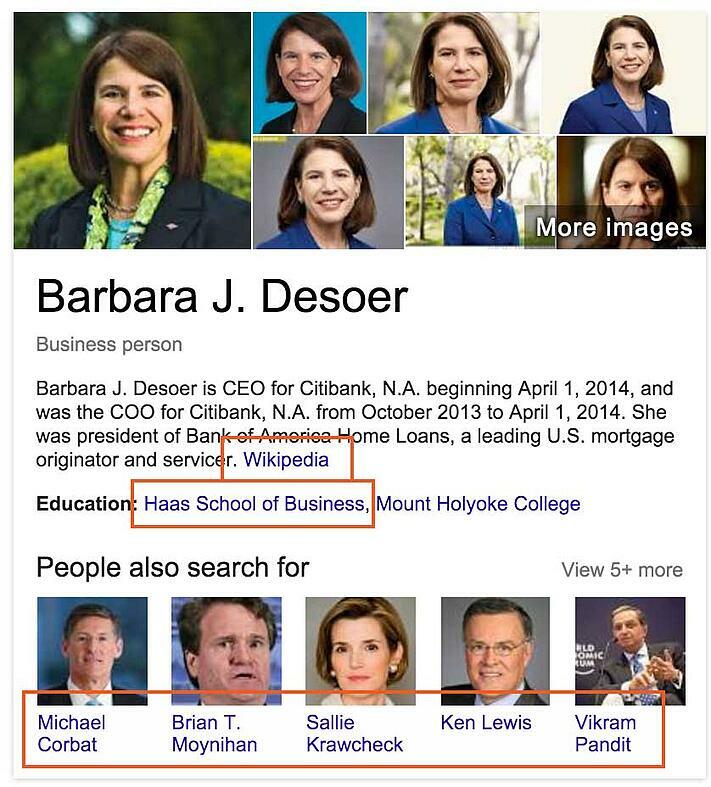 The highly visible Knowledge Graph was developed and now dominates search results. Search results affecting the parent corporation are completely clear, though some lingering issues with NYT exist. Other people have added to and edited the Wikipedia page which is stable in the number two position just below the corporate leadership page. Our client's LinkedIn profile is below the Wikipedia page followed by new articles that have since replaced the original Forbes article. Negatives that were originally seen by 100% of searchers, are now seen by about 5%. Find a path to success. Estimate duration. Understand costs.